This region, called the C-propeptide domain, plays an extremely important role in collagen assembly, defects in which can lead to serious, often lethal diseases. This work is published on the 23 September 2012 in the journal Nature Structural and Molecular Biology. A collaboration between groups from France and the UK, led by researchers from the Institut de Biologie et Chimie des Protéines (CNRS/Université Claude Bernard Lyon 1), have just determined the three-dimensional structure of a key region of the procollagen molecule, the precursor form of collagen, the most abundant protein in the body. This region, called the C-propeptide domain, plays an extremely important role in collagen assembly, defects in which can lead to serious, often lethal diseases. This work is published on the 23 September 2012 in the journal Nature Structural and Molecular Biology. Collagens make up a quarter of all protein mass in the body, where their role is to provide structural and functional integrity to all tissues and organs. As the major component of the extracellular matrix, these proteins are essential for the formation of several tissues, including skin, cornea, bone, cartilage, lungs and the cardiovascular system. However, excessive amounts of collagen deposition, or mutations in collagen genes, can result in numerous severe diseases. Collagen precursor molecules consist of three procollagen strands that are synthesized then subsequently assemble within the cell. These molecules are then secreted into the extracellular matrix where, following a process of maturation, they themselves assemble to form long collagen fibers. These two processes, assembly of the molecule and assembly of the fiber, are both controlled by the C-propeptide, a domain consisting of 245 amino acids and found at the end of each procollagen strand. Mutations in procollagen genes, including the C-propeptide region, result in numerous pathologies, often lethal, such as osteogenesis imperfecta or chondrodysplasias (1). In order to design new therapeutic strategies and to better understand the mechanism of action of the C-propeptide, the researchers (2) have determined its three-dimensional structure, by X-ray crystallography. This has enabled them to map the numerous mutations present in the C-propeptides of the different genetic types of procollagen and to correlate this information with the severity of the associated diseases. Thus the 3D structure could become a prognostic tool for predicting a priori the consequences of such mutations. Knowledge of the 3D structure of this domain could also make it possible in the future to control the formation of collagen fibers in the extracellular matrix. In order for these fibers to form, the C-propeptides must first be removed from the rest of the molecule by specific enzymes. Therefore, if one could prevent or slow down the removal of the C-propeptide, the production of collagen fibers could also be reduced. In addition, a better understanding of the mechanism of action of the C-propeptide could help to prevent the association of the three procollagen strands within the cell. Such strategies could thus prevent the many different kinds of fibrosis, a group of serious and often fatal disorders that result from an excessive accumulation of collagen in several organs including the heart, kidneys, liver and lungs. This work, supported by the Fondation de France and by the French National Research Agency, represents an important step towards the development of therapeutic molecules and is also the subject of a patent application. 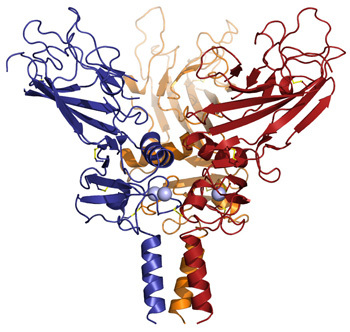 Three dimensional structure of the trimeric form of the C-propeptides of human procollagen. Each of the three strands is represented in different color. (2) Laboratories: Tissue biology and therapeutic engineering (CNRS/Université Claude Bernard Lyon 1), Structural and molecular basis of infectious diseases (CNRS/Université Claude Bernard Lyon 1), Unit for virus host cell interactions (CNRS/Université Joseph Fourier/EMBL,Grenoble), Wellcome Trust Centre for Human Genetics (University of Oxford).